These Point of Sales Displays have Different Colour Frame to Choose From! Click here for our online catalogue, a robust selection of hundreds of different products that can be used to outfit your business. From cafe banners, standoffs and lecterns to exhibition displays, portable counters, and acrylic brochure holders, there is sure to be something that will be beneficial to your business! Slimline Warehouse has been a leading provider of quality goods for 20 years, able to offer some of the lowest prices you'll find online. Our warehouse has same day despatch available on most in stock displays when purchased by 1pm EST! Order for your business today anywhere in Australia, including Sydney, Melbourne, Adelaide, Perth, Canberra, Brisbane, & Gold Coast! Point of sales displays help you to promote upcoming sales, price products, or ongoing events in an eye-catching manner that will easily get the attention of patrons. These retail POP signs include multiple colours to best match your décor or to stand out to easily be seen. Choose from blue, red, and black plastic frames! 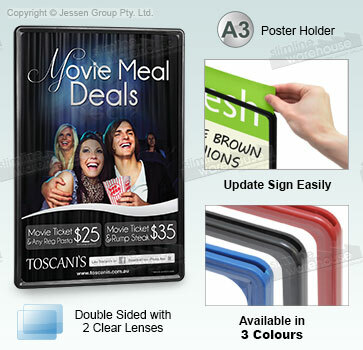 POS sign holders are designed to hold an A3 (420 x 297mm) graphic in portrait or landscape orientation. These custom graphics are held in a durable plastic frame that will last for years to come, even when used in heavily trafficked locations all day long! Retail display holders are dual-sided units that can be mounted to maximise space whilst reaching more customers. There are clear lenses supplied for each side of the frame. This ensures your graphics will not gather grime and dust while on display to maintain a professional appearance. 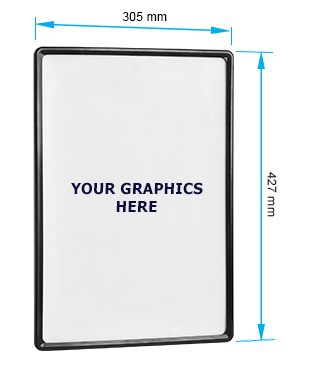 Switching out your graphics is easy with the slide-in design of the frames, with no tools required! These signs can be held in a variety of manners, allowing you to easily affix each one at your business using plastic clips, metal stands, and more. Order these custom retail display signs for your business today! A POP display helps to promote different items around your store in an eye-catching manner that will surely gain the attention of passersby. Our wide selection of different display options will help your business to pick the right style to fit your décor and needs.